Maybe you thought you were doomed to live with those dark circles and puffy eyes because it comes with age. 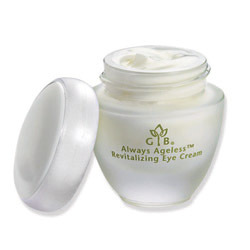 Yet, I got to test a new eye cream for Garden Botanika and am glad to report I saw a difference to help with that problem with their Always Ageless Revitalizing Eye Cream. This product uses caffeine and algae extract plus a blend of vitamins and botanicals to kick start this cream into action. There are no parabens, glycols, sulfates, phthalates, artificial fragrances or dyes either to cause irritation. I used this gentle eye cream for nearly a week and each day noticed a little bit more improvement in the appearance of my under eye skin. The skin in that area was thoroughly moisturized, smoother, and somewhat lighter than usual while the tiny wrinkles seemed to fade. Sounds almost too good to be true, but this was an amazing product that now has a permanent spot on my vanity. Honestly, I never tried any Garden Botanika products before this review. However, I think this company is worth investigating further with how pleased I was with their Always Ageless Revitalizing Eye Cream! Connect with Garden Botanika on Facebook. I already follow you on GFC as cardprincess. thanks! I would really love to try their Lip Scrub. Luckily my lips are in good shape most of the time, but I have a terrible habit of just picking at them when I get a little dry skin. Having this product handy would help me get my act together with that! I would like to try the Heart So Natural Hand and Body Lotion 8 fl. oz. Crude, forgot email addy's on comments 152, 513 and 154…darbyscloset at yahoo dot comThanks!! I'd try the Fresh Mint Body Lotion. GFC follower: Atreau.I'd love to try the Ginger Blossom Body Butter. I'm a GFC follower.Lotus Pressed Biomineral Mesmerize Eye Shadow Palette. I am a GFC follower and I also like the Sweet Mint AHA Foot Treatment from the site. you should try there Daily Mineral Guard with spf 25. It's a good and great product and it also acts as a good sunscreen. If you are looking to find the best wrinkle cream, look for the ingredients of the product and if a product does not disclose their ingredients then the other way to find the best wrinkle cream is by reading consumer wrinkle cream reviews.